What makes a table uniquely beautiful? Of course, that’s a completely subjective question. Perhaps most of us can agree on what’s not particularly lovely. But, for me, there’s a fine line between bland formality and truly unique and beautiful styling. Not only do I know it when I see it, but I can actually feel it when I see it. It practically calls to me and resonates in a way that exudes a life well lived. It goes beyond “upscale” and requires something more subtle. But since I’m going for individuality, following I offer you 8 subtle tricks to take your table from boring to unique. 1. 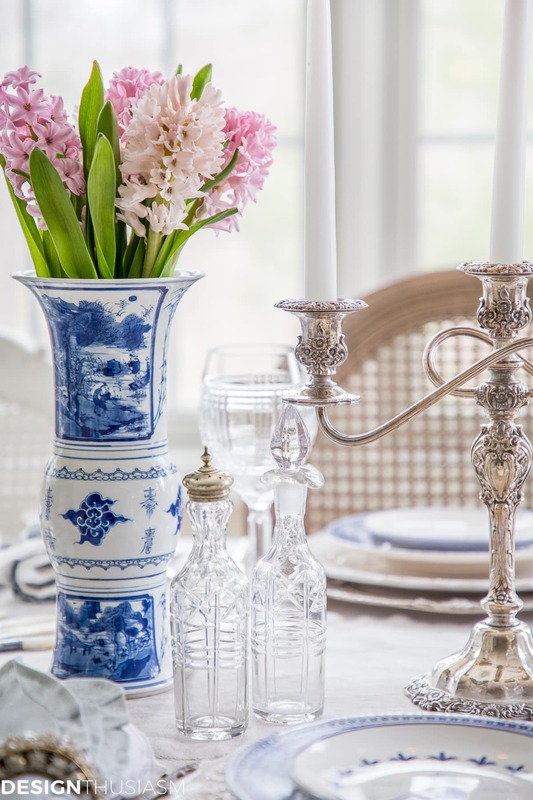 Antiques – If there’s one thing that can bring individual style to your home and your table decor, it’s bringing in antiques. Almost by definition, their one-of-a-kind nature adds a fresh spin to wherever they’re used. You may see something similar elsewhere, but rarely is it the exact same thing. Their gentle patina also lends a note of authenticity. 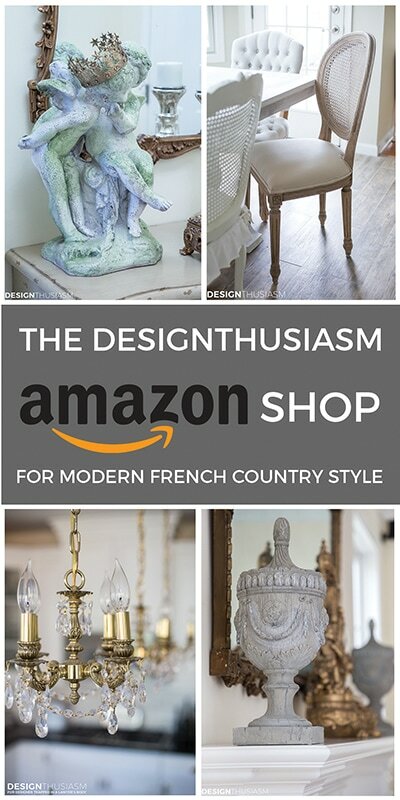 I favor French antiques, given my love of French decor, and they have a way of adding pedigree, as well as that defining sense of style. 2. Multiple plates – I enjoy layering my plates for a variety of reasons. 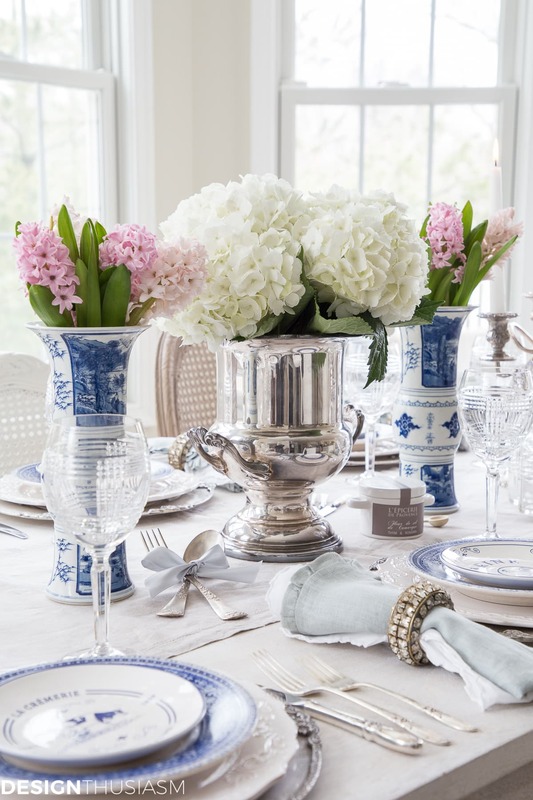 It’s an opportunity to set the tone of the tablescape, mixing casual with formal and setting the color story, as well. But additionally, it gives one the chance to use the plates in different ways than you might see anyone else using them. It’s like putting your own outfit together mixing several designers, rather than wearing the whole outfit straight off the rack the way someone else designed it. It’s a more creative way to approach styling which makes it inherently more unique. 3. Double napkins – I often roll two napkins together before I cluster them in a napkin ring. I like the option to mix colors and textures, and it gives the entire presentation a weightier feel. Sometimes I use sheers to change the way the colors look, another place to infuse my own take. 4. Mixed plate patterns – Along with using multiple plates, I also like to mix dish patterns. Besides adding interest to the stack itself, a liberal mix also has a practical side. 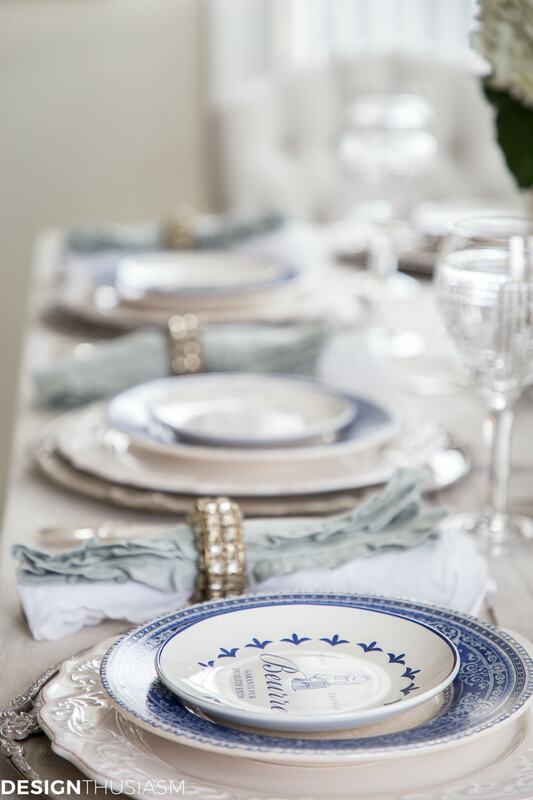 It’s easy to use favorite plates even if you don’t have enough for the whole table when you’re mixing different patterns throughout the setting. On this table, I only had 6 of the main silver chargers, but I used 2 different patterns at the end seats. If everything else was matched, this would be more obvious, but with a loose mix, they’re barely noticed. 5. 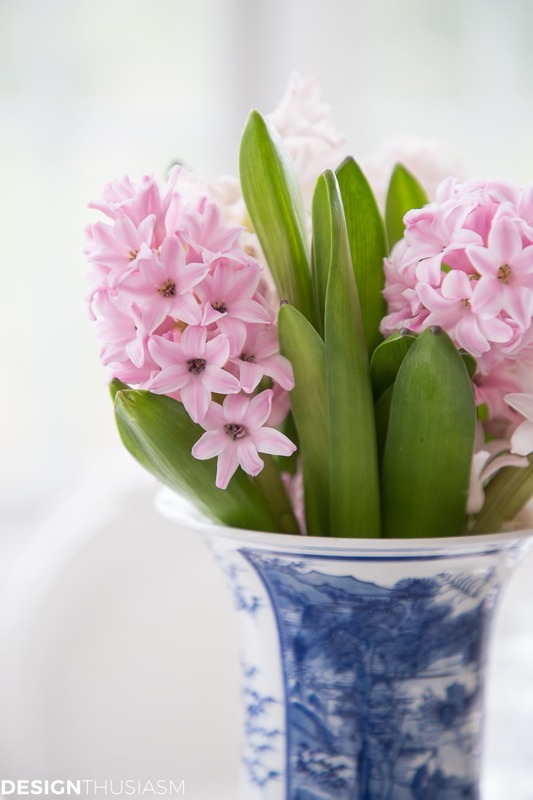 Fresh flowers in several arrangements – Anyone can go to the florist and buy a common mixed arrangement, but for a more unusual showing, it’s fun to use flowers in various vessels and let the play of colors tell its own unique story. You can use varied heights and different shapes with movement to make a statement that will entertain your guests. 6. 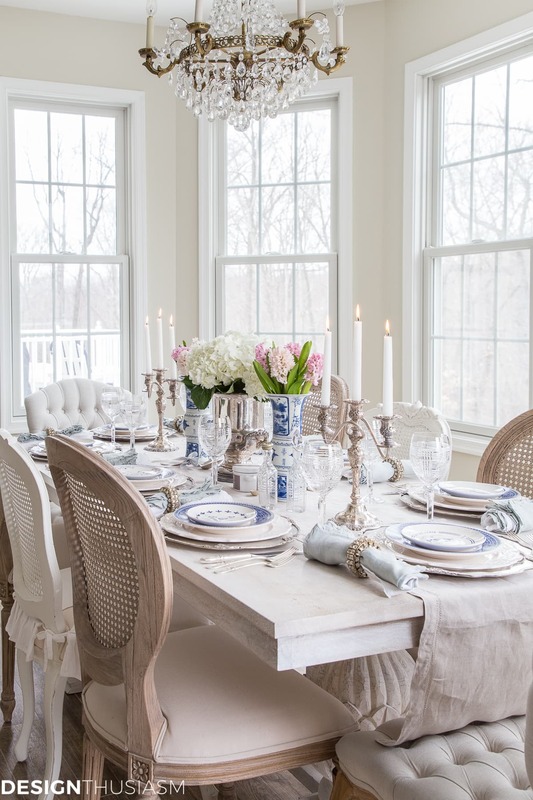 Offbeat color – I love to soften the look of a table with pale offbeat colors. 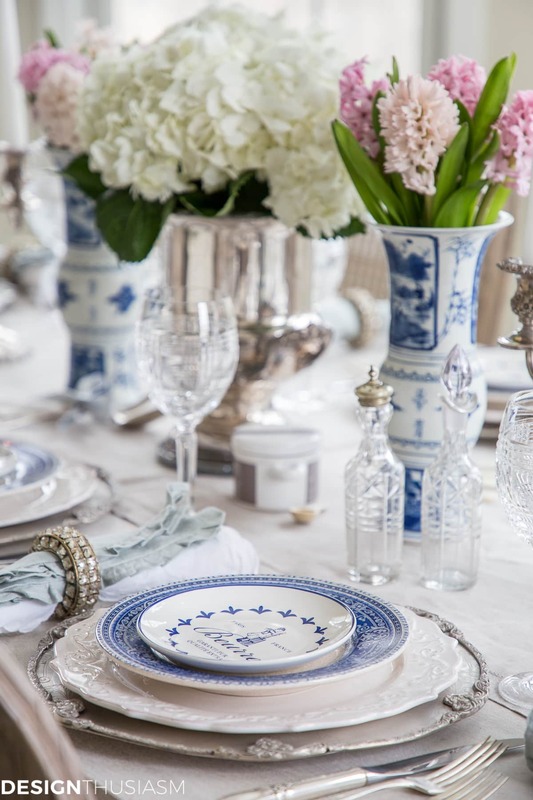 While this table is primarily china blue and white, the use of the whispery blue in the bow above and the ruffled napkins gives the tablescape a gentler feel than if it was all the crisp blue and white. Sometimes the addition of one offbeat item can throw a table in a new direction that’s rare and fresh. 7. Mixed chairs – It’s impossible to ignore what sits around the table and I love to use a mix of chairs to add a distinctive look to my tables. 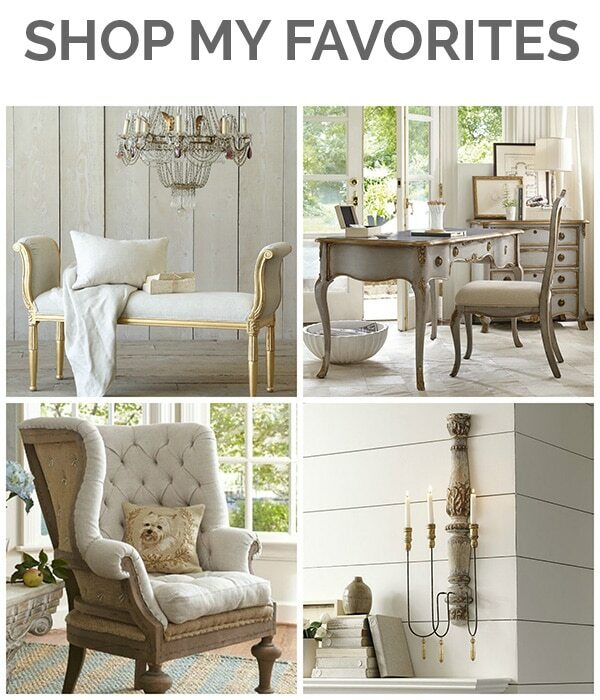 Of course they’re all French style chairs, to go with my favorite look, but the mix is what distinguishes my style from other people who have similar chairs. The key is to get pieces that are similar enough to peacefully coexist, yet different enough to look intentional. 8. Raw table with a table runner – While I do enjoy using tablecloths, sometimes it’s fun to leave the raw table exposed and use only a linen runner. If your table has a chippy finish or an interesting texture, this is particularly true. The pale linen of the runner provides another opportunity to add a soft hint of offbeat color for interest. 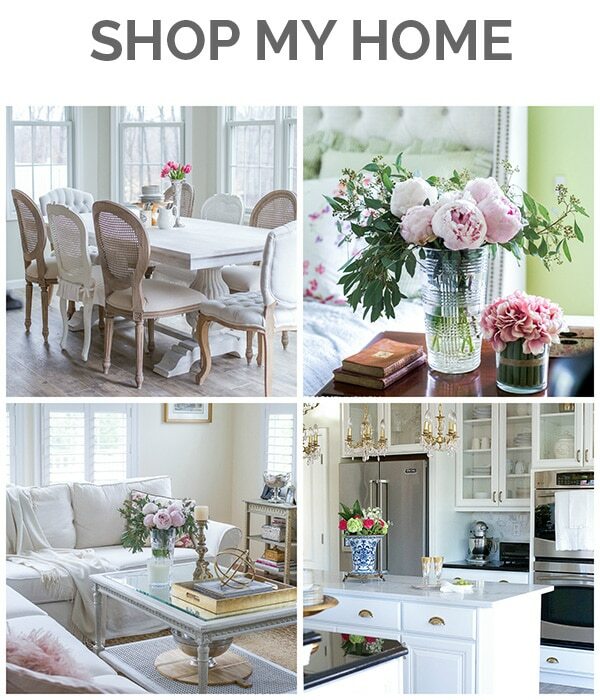 I’m a firm believer in filling your home with things you love. 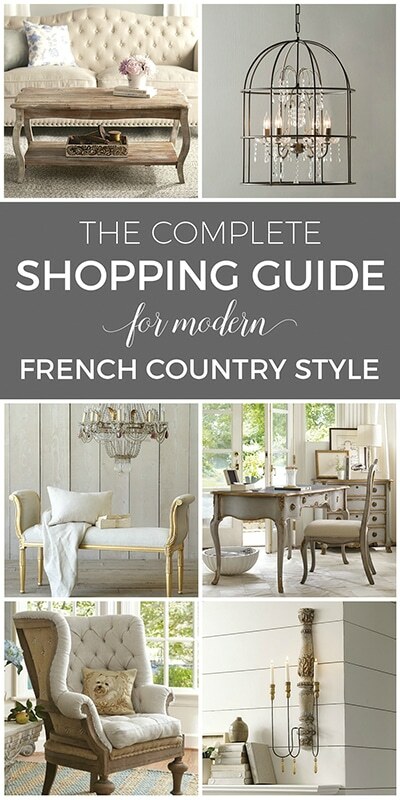 The more I refine my home, the more careful I am to edit my styling to be ever more French, and yet ever more updated. When I entertain, I want my table to reflect that very same philosophy. 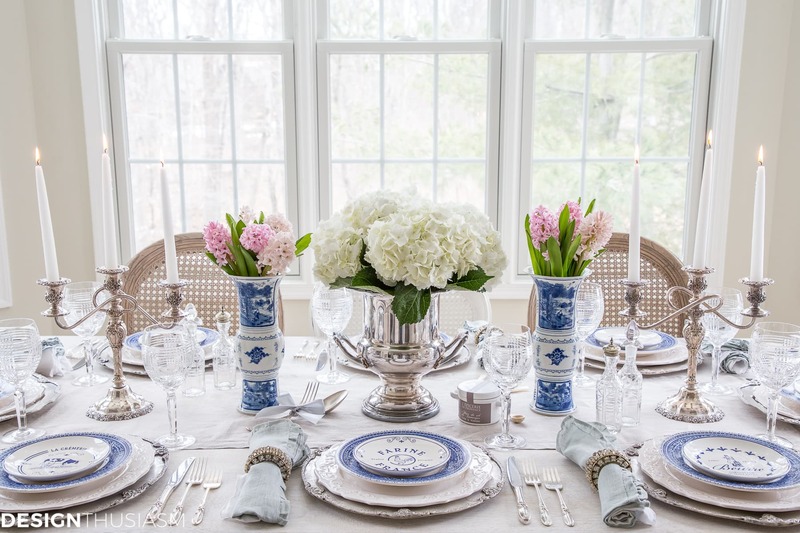 It’s a joy to to find your style and express yourself through decorating and if I can do that with my table decor and communicate my unique self with my guests, I will feel more comfortable as I enjoy being their host. Table Decor Source List – To get the look, click on the items below for direct links to the products. Where actual items were no longer available, I’ve provided similar options. 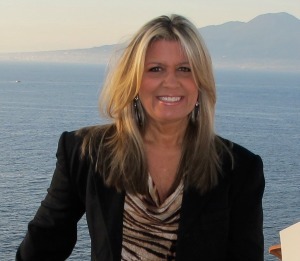 Lory, loved your post! Gave me a lot of great ideas since I have just retired and I want to start doing some entertaining with friends. This was always on the back burner when I was working and is something I really enjoy doing. Thanks again for the inspiring post! 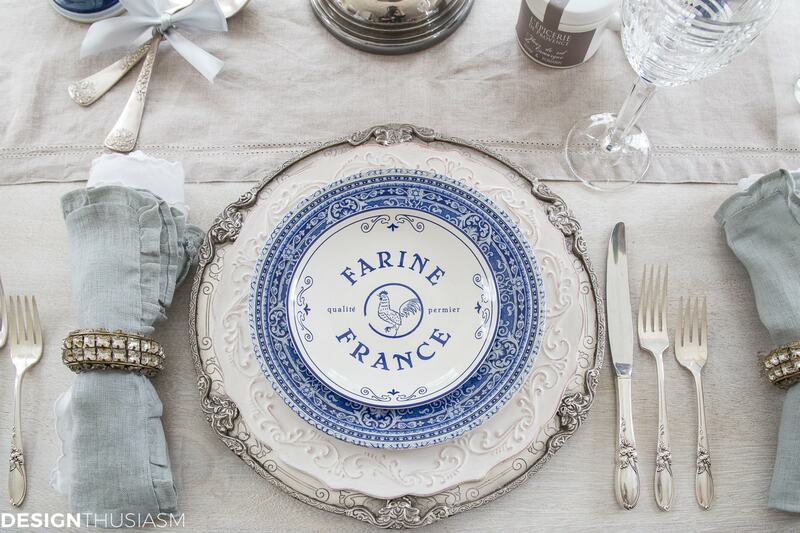 Such a beautiful tablescape, Lory! Always jam packed with inspiration. ? 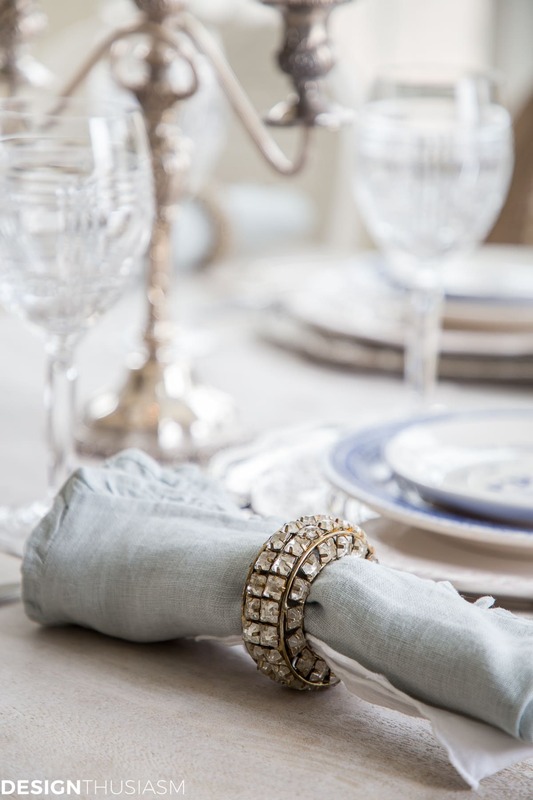 Where did you get those beautiful napkin rings? I want them!!! Lory, your table-scape looks lovely. I love you silver chargers. (note I am not saying anything about the flatware). Lory, your candelabra are beautiful! 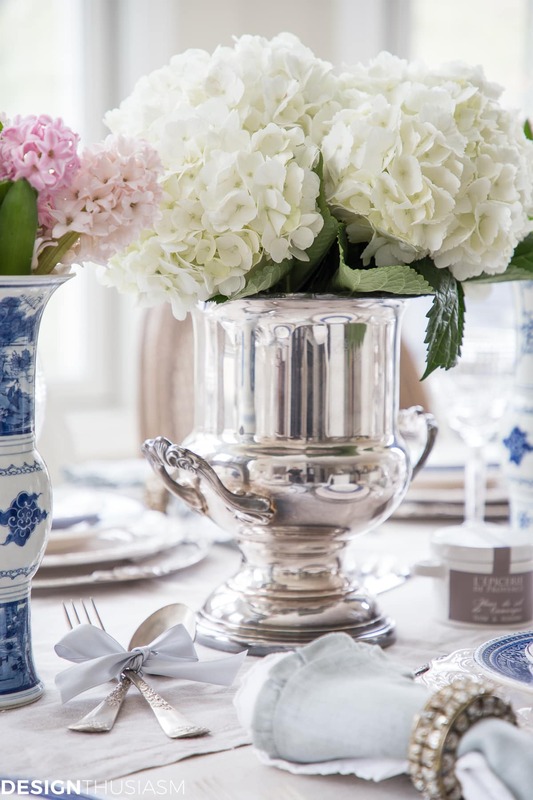 They help anchor the table and add the pedigree that makes it elegant and timeless. This is a lovely table. Just beautiful. The silverware in the bow has to be some of the most beautiful I have ever seen. You have such treasured pieces. These are such great tips! So glad you brought up the double napkin trick. I’ve been seeing that one more recently. Pinning for later! Lory I love your talent and that you share it with us. 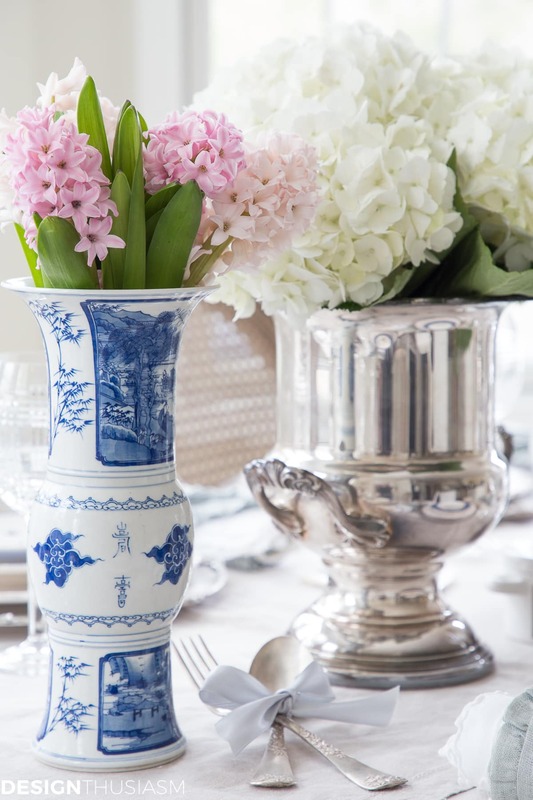 How do your guests see and converse over the flower arrangements in the tall china and silver vessels in the centre of the table? As always your style is so classy and I learn so much from you. The table is so gorgeous. Every detail is so well thought out. I love the elegance of how you put it all together. Like everyone else, I think your table is aways beautiful, especially this newest creation! I do have a question —- you use double napkins and I wonder if it’s difficult for your guests. Do they just leave one on the table and use the other? When “unwrapping” them, is it a problem or does everyone know your decorating style and actually expect to have 2 napkins? They’re beautiful together no matter what. 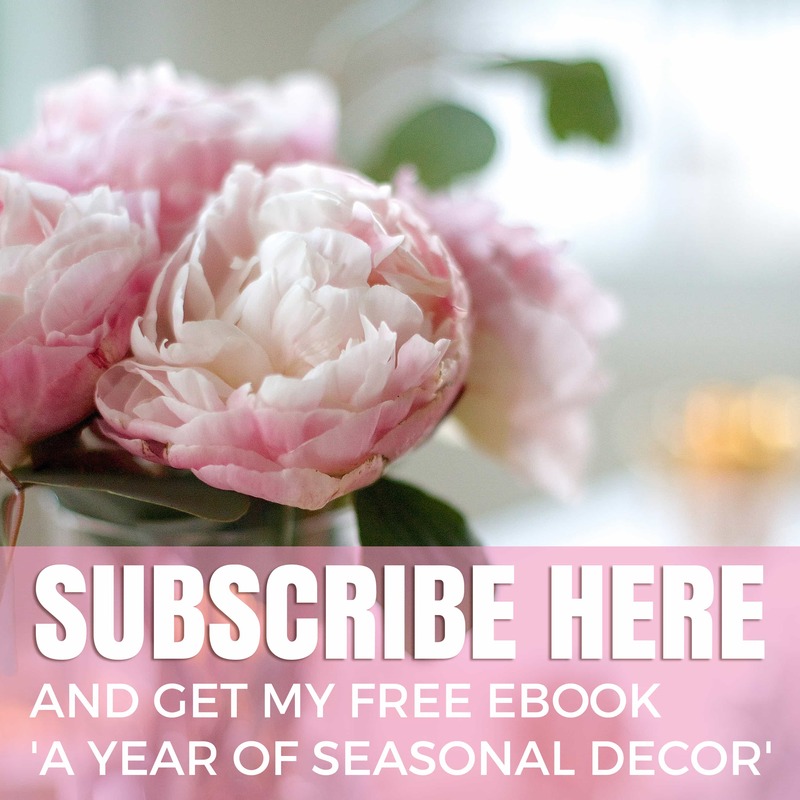 I just found your site and I love it – it’s exactly the blend of elegance and fun I’ve been looking for! (Plus you spell and punctuate correctly! Such a joy to get through an entire paragraph without rolling my eyes!) Thanks for the beautiful inspiration! Thank you so much! And welcome!! plethers of lots of other fun pieces, I play decorator every day!! Well, I’m going to fix us some double napkins now and change my runner but I’ll see you soon! You definitely put a smile on my face today… 🙂 It’s a pleasure to have like-minded people reading the blog!! The tabletop looks fabulous. I love how you use what you have and mix and match. It all comes together so beautifully! I really love the old bought and inherited items for use on the table. 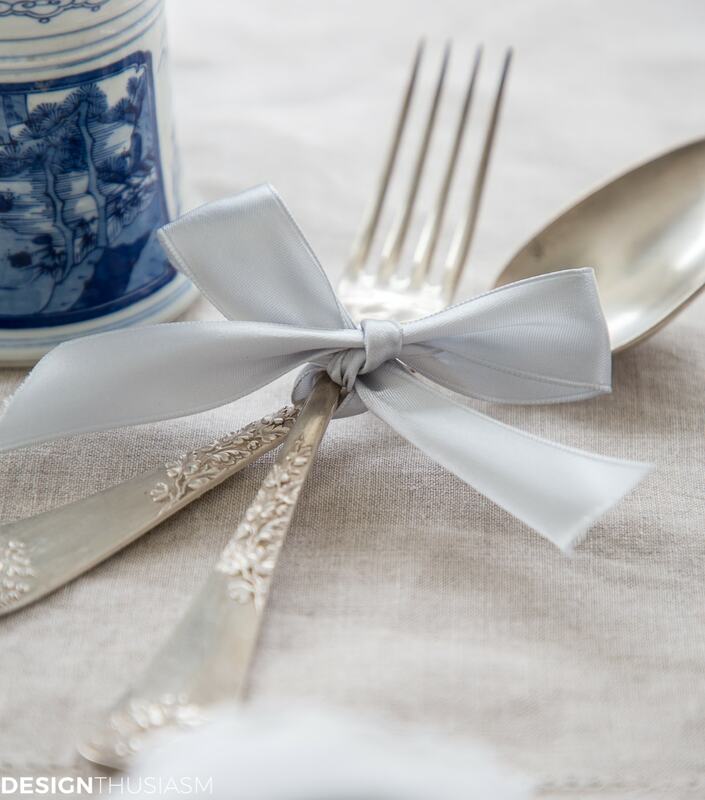 From antique family linens and silver to things I have found for 50 years in the antique shops, it is fun to change it constantly. They each make a table unique. I love keeping my dining room table set so I can enjoy the effort to make it look beautiful and I change it regularly. Your settings are exquisite and give me so many ideas. Love the double napkin idea.